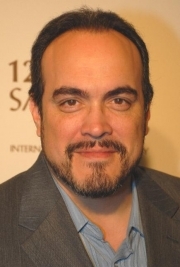 David Zayas is a Puerto Rican theatrical, film, and television actor. He is most known for his roles as Angel Batista on Showtime's series Dexter and as Enrique Morales on the HBO prison drama Oz. Born in Puerto Rico, but raised in the Bronx borough of New York City, Zayas joined the United States Air Force early in life, where he gained skills that would lead him to join the New York City Police Department after he was discharged from service. Zayas' career as a police officer in turn allowed him to develop as a character actor, leading to a series of acting jobs on television and film mainly playing law enforcement officers. However, working in law enforcement also provided Zayas with the ability to play characters on the other side of the law, like Enrique Morales on HBO's long-running prison-drama OZ. In a total number of 28 episodes from 2002–2003, Zayas's character became one of the most ruthless inmates featured in that series. Zayas is also a talented musician, having performed as a percussionist with artists including Jason Mraz. A member of the LAByrinth Theatre Company since 1992, a New York City-based traveling actors group, Zayas has branched out into television and film projects, which has diversified his résumé with guest roles in such popular television series such as New York Undercover and NYPD. It was at LAByrinth where he met his future wife, actress Liza Colón-Zayas. They presently reside in Los Angeles where Zayas plays homicide detective Angel Batista in the Showtime drama Dexter. Whole or part of the information contained in this card come from the Wikipedia article "David Zayas", licensed under CC-BY-SA full list of contributors here.